Garmin's Forerunner series of GPS enabled sports watches have become the favourite choice of keen runners and the latest in the line, the Forerunner 610 looks set to continue its success. 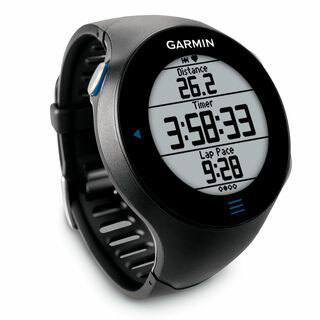 Targeted at runners, the new slimmer watch is the first from Garmin to offer a touch screen interface and a high resolution display. Other new features include a vibration feature which can be configured to provide alerts for heart rate, pace and distance. Also introduced with the Forerunner 610 is Virtual Racer�. 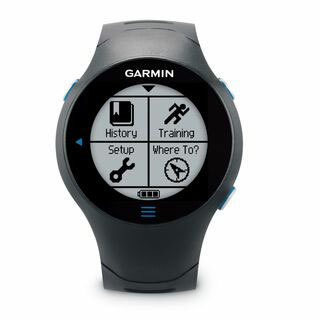 Runners can race against their previous best times or even against other runners using data downloaded from the Garmin Connect community. The Forerunner 610 is on show at London Marathon Expo which starts today and Garmin have a limited number of the watches available for sale on their stand (#230 Halls N1-N8) and will also be taking pre-orders when stocks are exhausted. It would be good if the batteries lasted as long as a regular watch, that is the only drawback with these, battery life. I have a regular watch which I bought in 2003 and haven't changed the battery yet, still running, it's a Casio, a pity they don't do GPS watches. GPS has a significantly higher power drain than that of any normal watch. I doubt Casio could make one that lasted much longer without it being a very large and bulky device. You can turn the GPS off when not needed to reduce battery drain though. So there you are gasping for breath your whole body shaking, and you're trying to work a widgy little touch-screen? You set it up before you start, there shouldn't be any need to use the touch screen but if there is, it has to be a hell of a lot easier than the previous version that had a touch bezel. That was a royal PITA to use and universally hated as being far too fiddly. I have to say, I must agree with Brian. I have a Forerunner 405 and the problem isn't with the battery running out - it easily lasted a day when you only used GPS for exercise. The HUGE problem with these Garmin watches is the battery life. Once the rechargeable battery stopped holding its charge the watch would not last for even an hour - pointless for anything! After contacting Garmin, they said they could not replace the battery, but would send me a reconditioned one for about �70 if I sent mine back. So basically, I paid hundreds of pounds for a watch which I will have to pay a further �70 every 18 months/2 years if I want to keep it working. It also strikes me as funny that they are not able to replace the battery, yet they have a steady stream of watches that are reconditioned. Where do they come from then? I would have been less annoyed about this if this had been made clear when purchasing the watch - but it wasn't - check Garmin's support pages to see that they don't actually refer to changing the battery in YOUR device - nor about the charge they make for doing it! All in all I would NOT recommend buying a Garmin GPS watch. Battery life is a problem but there is a solution for the Garmin 305. If you google it you can find instructions on howe to replace the battery. It basically uses a nokia mobile phone battery which is about �6 on ebay. for th e405 and newer then this may be more difficult though.